The 4-inch square Intel® NUC Kit NUC5i3RYK takes the powerful capabilities of a desktop system and packages it into a computer that fits in the palm of your hand. This fully scalable system comes with the latest 5th generation Intel® Core™ i3 processor and integrated Intel® HD Graphics with 4K display support, packed into a stylish Mini PC that can easily fit into any ...room in the house. 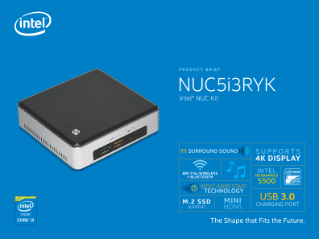 Whether you want a digital jukebox, home hub, or light gaming PC, the Intel NUC Kit NUC5i3RYK gives you the power to play, create, entertain, and inspire. The system is designed to hold a lightning fast and compact M.2 SSD so you can quickly stream music or movie files, and also features consumer infrared and a Mini HDMI* video interface. With Intel® WiDi you can connect your monitor without any additional cables and Bluetooth lets you place wireless speakers where you want—all the features you want in a space-saving, clutter-free design. A replaceable lid gives you plenty of options to create the NUC you want—with amazing style and features. There's also a high-speed USB 3.0 charging port that lets you easily charge your tablet or smartphone quickly. The Intel NUC Kit NUC5i3RYK is equipped with the 5th generation Intel Core i3 processor featuring Intel® HD Graphics 5500 with 4K display capabilities to provide amazing performance and visually stunning graphics for mainstream gaming, and video and music streaming. Performance and graphics coupled with the addition of 7.1 surround sound delivers the digital jukebox you always dreamed was possible.